Why aren't my entries passing through? 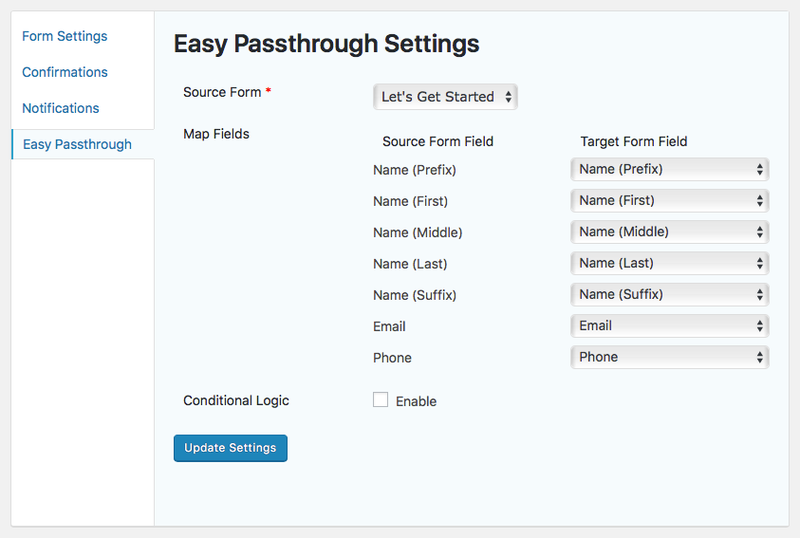 Easy Passthrough simplifies transferring entry data from one Gravity Forms form to another. Instead of spending time setting up dynamic parameter names and customizing confirmation query strings, you can passthrough data by setting up an Easy Passthrough configuration. Note: File upload fields are not supported by Easy Passthrough. On the form data needs to be passed to, go to the Form Settings page and click on the Easy Passthrough tab. Click the Add New button to create a new Configuration. Select the form you want the entry data to transfer from. In the Map Fields section, select what field on the current form should be populated from the field value of the source form. Fields on both forms that share the same name will be automatically selected. In the Map Meta section, select what entry meta from the source form should be populated into the target form. This can include the entry ID, entry URL, payment related data and more. Enable Conditional Logic if you only want an entry data to be passed through if it matches certain criteria. Click the Update Configuration button.